Request Taxi/Airport Transfer Quote (Early booking recommended). Please fill the Combined Airport Transfers and Car Hire form, if both are requested. Some cars can also be booked online..
**Mayjo will suggest pick-up time according to flight details provided and ferry schedule (if travelling from Gozo)** . Direct transfer to/from Gozo Have a driver take you all the way to/from Gozo, with you on the ferry as well. Starts from €65.00. Split transfer to/from Gozo One different driver/taxi on each side of the island. The driver does not accompany you on the ferry. Starts from €52.00. Airport to/from Malta ferry terminal Private taxi to/from the Ferry Terminal in Malta only. Starts from €35.00. In case of car hire, it can be delivered to the Gozo Ferry Terminal. Notice: Please add our email address info@mayjocarhire.com to your safelist or whitelist. Kindly always check your JUNK MAIL FOLDER as some emails may incorrectly go into the spam folder. We always reply to each and every email. Mayjo airport transfer offers a low-cost private Door to Door Taxi Service on a 24Hour basis. The company operates a personalised service and can take the traveller anywhere in Malta and Gozo by taxi or minivan depending on the number of persons. Baby or Booster seats can be included in the taxi free of charge upon request. We also provide Airport coach transfers to cater for groups. Our drivers will wait for you even if the flight is delayed and will accompany you all the way on the ferry as well. We will drive you straight to your final destination with no stop-overs and this will ensure that you will get to your destination the quickest way possible. Taxi pick-ups are also provided to/from any address in Malta. 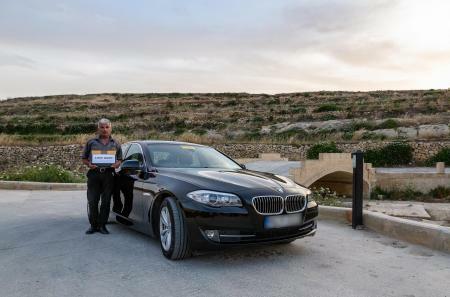 Should you book car hire, this can be delivered at your Gozo accommodation and the driver will show you the car upon arriving at your accommodation. Are you looking for a trouble-free Airport Shuttle Transfer? You will find our driver waiting for you at the Arrivals Lounge of the Malta International Airport with a name board and will transport you by Minivan or Taxi accompanying you all the way to your final destination in Gozo. This is a very convenient option as the luggage can remain in the boot of the taxi while you can go on the upper passenger deck of the ferry. 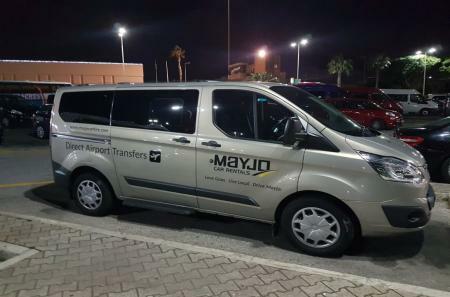 Mayjo only offers private and personalised transfer service. We also provide taxi transfers to/from any accommodation in Malta. The rate for a door to door transfer starts from only €65.00 for a taxi, and this includes also the vehicle ferry ticket. We collect you from Malta International Airport and transport you to Cirkewwa Ferry Terminal (Malta side). You then go on as foot passengers on the ferry to Gozo and another driver will collect you on from Mgarr Ferry Terminal (Gozo side) and take you to your final destination. This option is as well private and NOT a shared service with other people. The rate for this service starts from only €52.00 for a taxi. Upon welcoming you at the Arrivals Lounge the driver will take you to Cirkewwa Ferry Terminal in Malta via a private transfer in order to get the next ferry. You will travel as foot passengers on the ferry. 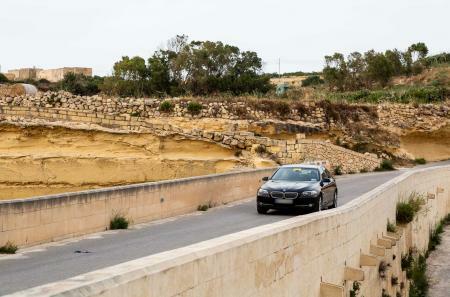 Should you have a car hire booked with pick up from Mgarr Ferry Terminal in Gozo, the driver will provide the details on how to collect the car. The rate for a taxi starts from only €35.00 for a taxi. How far in advance should Airport Transfers be booked? It is generally recommended to book your airport transfers once you book your flights. This will guarantee the availability of driver and car. However, we always do our best to accommodate any request. Is it possible to book the ferry crossing to or from Gozo? It is not possible to book the ferry in advance. While it is possible to purchase passenger ferry tickets beforehand, it is not possible to book a ferry crossing for a particular ferry time. You just need to turn up. When booking an airport transfer, we can arrange the pick-up time and allow the necessary time to buy the tickets and join the queue. When booking a door to door airport transfer, our driver would take care to purchase the tickets for you. The passenger ferry tickets are only paid one time on Gozo going to Malta. Click on ferry schedules to check the ferry timetable.